It appears to be company policy at Stardom to hit the year at a sprint. This was their third show of 2019 and the first of two that they held on the 5th of January. I shall, of course, be reviewing both, so let’s get down to it. Did Jamie Hayer and Bobbi Tyler lose a chunk of their match? We got a beginning, where Hayter was stalling, leaving the ring and doing everything in her power to avoid getting into a fight. Then, when she eventually returned, we got a couple tests of strength before slipping up a gear and seemingly building to the next act. Except, just as it seemed like we were getting started, Hayter ran through a sequence of moves and got the win. Perhaps the intention was to get Jamie Hayter over strong, showing that when she wanted to win, she did. However, it felt like these two were building a much longer contest before having the bombshell dropped on them that they had to go home now. It wasn’t bad, it was just, lacking. We’ve got a tournament on our hands. I have no idea what the prize is, or even if there is one. Perhaps it shall be the friends we make along the way. Early on the sisters were able to swarm Natsumi, taking advantage of the ref’s lax approach to enforcing the rules. Although, we also got to see a little bit of solo action from all three and it baffles me how someone that young can have any talent, nevermind that much. Of course, this was only going to end one way. While they tried hard, getting a series of flash pins on Gracia, when Hanan was left in the ring alone, she stood no chance. A Top Rope Thesz Press from Gracia (in which she actually flew over Hanan’s head) got the win. It was a shame that the final move missed, because until that this was an entertaining match in which the rookies shone again. I say the rookies, but the most experienced member of the other team was Starlight Kid who is seventeen, so it’s not like they were up against the New Japan Dads. All in all, it gets a fine. A few words on Sadie Gibbs as I don’t think I’ve given her the credit she deserves. She is an outstanding athlete who flips around the ring doing incredible things flawlessly. At the moment, her timing is a little off, and you can see she’s thinking about everything she does, but with a bit more experience, she could be fantastic. Outside of that observation, this was another fun tag match with not a huge amount to say about it. Hana Kimura’s time on top stood out as her charisma shone through. Elsewhere, Viper always shines and Bea threw some fantastic looking kicks. Viper would eventually pick up the win over Mary Apache in a good match. It’s time to sing along with Sumire. When Tora tried to stop her with a kick, Natsu merely shushed her and got on with it. Even when the JAN team started slamming her she still doggedly continued her Freddie Mercury routine. What an incredible show of will. When Natsu managed to escape that horrible treatment the action picked up. Hazuki and Jungle Kyona started it before Kyona and Kagetsu really took off. Everything those two do together is exciting, and I can’t wait to see them face off one on one. To complete her astonishing display of endurance, Natsu Sumire would end up victorious, trapping Ruaka in an Inside Cradle for the three. This was the best match so far, and it had flashes where it was even better when Kyona was in the ring with Hazuki and Kagetsu. Nothing life altering, but a lot of fun. Tam shaking the ropes to knock Hoshiki off them during their entrance nicely sums up why I’m enjoying Stardom so much. Alongside the talented wrestlers, there’s an unmissable feeling that everyone is having a lovely time. From the sometimes awkward pre-match promos to the silly sense of humour that’s evident in a lot of the matches, it’s a genuine pleasure to watch. Anyway, there was a match which I should talk about too because it was damn good. Although it’s one of those damn good ones where I’m not entirely sure what to say. It was six wrestlers delivering some terrific action. Sometimes, you don’t need to overcomplicate that stuff, just sit back and enjoy it. I shall say that the kicks being thrown were particularly thrilling. Konami and Hoshiki were trading some vicious blows. Perhaps not quite as vicious as the accidental Moonsault to the face that poor Tam Nakano took. Thankfully, she seemed to be okay, as that could have easily broken a nose. Nakano would get a small measure of revenge, flying off the top rope to land knee first on AZM before finishing her off with a Shining Wizard. She’d then get face to face with Momo after the bell as they continue to build their feud. As I said, this was fantastic. An exciting back and forth bout with only the one small botch to let it down. I’m sure the wrestlers involved had another gear, but they were working a show later that same day, so can you blame them for not reaching it? Quite frankly, they could have taken it a hell of a lot easier. 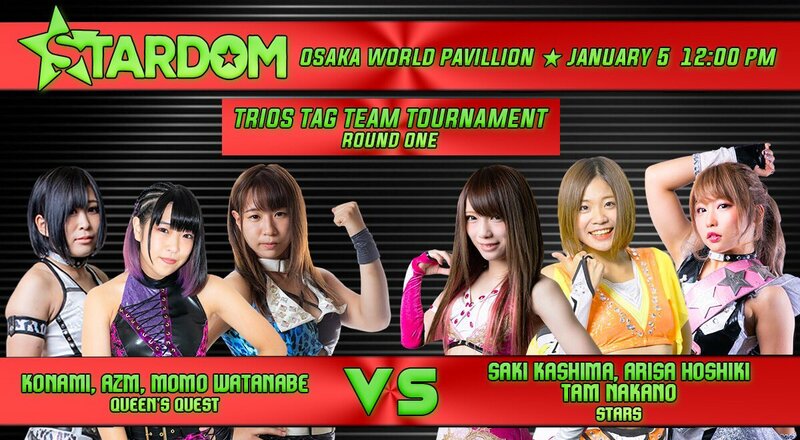 As I mentioned, this was the first of a two-show day for Stardom so it would have been entirely understandable if they’d phoned it in. However, they did nothing of the sort. It was a fast-paced show with a lot of enjoyable action. Essential? No, but solid viewing all the same.